This week we would like to spotlight our upcoming venture to Chicago for “Write to the City” presented by Young Chicago Authors. 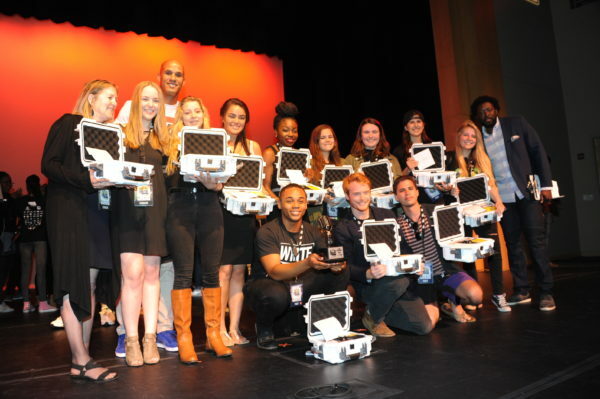 Last month the Omari Hardwick bluapple Poetry Network wrapped up the second annual Louder Than A Bomb Florida presented by Nova Southeastern University and UPS 12-day spoken word poetry festival, which featured 33 high school poetry teams from four different school districts across South Florida, as well as a host of other elementary schools, middle schools and colleges. The “Super Bowl of Poetry” brought out the best in South Florida’s youth poets, competing for the number one spot and a trip to Chicago, Illinois for a five-day poetry and writing symposium. Last year, as part of the inaugural LTABFLA, Zoharian Williams, who won the Indy competition, along with the Miramar High team of poets who claimed the overall crown were awarded the trip to attend an educational camp. “Write to the City” presented by Young Chicago Authors, is a five-day poetry camp designed to help young artists improve on their writing, verbal, and theatrical skills. Joining the winners last year was bluapple teaching artist, Marnino Toussaint. This opportunity not only provided Marnino with an educational benefit, but also the chance to experience a new community and meet new people. “I hadn’t left South Florida since 2001,” Marnino shared. “Write to the City” provides young artists with the opportunity to learn more than what is presented in a traditional poetry classroom setting. The campers are taken to different museums and art centers in the Chicago area, learn how to become one with their body through dance, and are taught different meditation tactics to create a relaxing atmosphere. This year, Jason Taylor had a different idea. During the team finals at Nova Southeastern University he became extremely engaged in the competition, particularly because of how powerful the poetry was and how closely the teams’ scores were. Jason ultimately decided that he wanted all four teams to experience Write to the City, announcing that the nearly 40 students who competed in the team finals were going to Chicago for this year’s summer camp, expectedly to the delight of the students, and all in attendance. Currently, the Jason Taylor Foundation is fundraising to send the group of 40 students, along with their coaches, to Chicago. The “Write to the City” summer camp runs from July 25th to July 29th, 2016. If you would like to support this effort, PLEASE DONATE NOW! To learn more about Write to the City, WATCH THE VIDEO PROFILE.